New Haven has long had a bad reputation as a rough and dowdy city. Truth be told, this characterization has always reeked of sour grapes to me–it seemed like the only people talking about how “awful” New Haven is are those Yale students who are maybe just a bit bitter they didn’t get into Harvard. Sure, playing chess in Harvard Square while listening to a hippie blow on a didgeridoo may help get you in an academic mindset, but wouldn’t we all prefer to live in a “real” city where we’re part of the re-urbanization movement? No? Well, forget you then. Truth be told, poor ‘lil New Haven’s feelings have been hurt numerous times over the years by those sneering Yaleys. During the 1960s and 1970s, which were a truly dreadful era for urban renewal ideas, the city threw its weight behind nearly every failed concept–a civic center! huge parking garages! a massive, concrete bunker-styled mall! a suburban-style office park!–all in the name of making itself just a bit more loveable. Today, these buildings–including the Coliseum, which is currently being demolished–help form a downtown graveyard of concrete tackiness. All those Yale kids didn’t realize that words hurt, man. One of the most notable projects of that era was the Chapel Square Mall, built right on the edge of the city’s common near the intersection of Chapel and Church Streets. 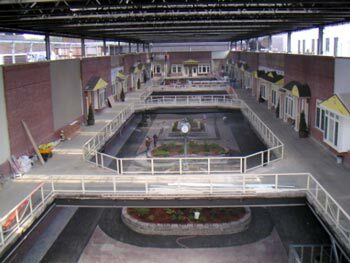 As usual, those scamps over at Deadmalls have a more complete history than I could offer, but this mall had a very strange configuration wherein the anchor stores (a large Macy’s and an Edw. Malley Co.) were each on the two southern blocks (on either side of George Street, along Church St.), and the mall was on the northern block closest to the common. Because the mall spanned three city blocks, it meant that each building had to be skywalked together, but since Macy’s was on the center block, both anchors were at the same end of the mall and it was necessary for Malley’s shoppers to walk through Macy’s to reach the mall. When I first visited Chapel Square Mall in fall of 1999, it was already in a pretty severe state of decline, and Macy’s was already long gone. The mall itself still hosted a few national chains as well as a bevy of local stores (as detailed in this snarky Yale Herald piece) appealing mainly to an urban clientele, including a large (and seemingly very successful) independent record store focusing on R&B and Hip-Hop. The main mall area was a large, bright, wide two level corridor, with terracotta tiled floors and glass railings around the upper level. There was also a large fountain on the first floor near the common entrance. Still, it was showing severe signs of wear–I distinctly recall a lot of the metal portions of the railings to be rusting, and it was the last time I can remember witnessing a shell of a former Marianne’s/Petrie’s store. Beginning around 2000, New Haven began to change. Yale University, apparently growing tired of cries from their student body that they didn’t have a convenient Starbucks or J. Crew, decided to take matters into their own hands. They bought many derelict buildings clustered around many of downtown’s boulevards, fixed them up, leased them, and resold them. While gentrification is definitely banging on the door now, New Haven is rapidly reclaiming its place as a destination city, with lots of nightlife and shopping and restaurants. Thusfar, it hasn’t gotten the same attention as other northeastern Renaissance cities like Providence, but it’s only a matter of time. The renaissance of the Chapel Square Mall is part of this. The mall was shuttered in the early-auts and very slowly redeveloped as a mixed-use center that faces outward, instead of inward, and hosted foofier stores like Ann Taylor Loft and Cold Stone Creamery (and I bet those Yaleys love tormenting those creamery kids by making them sing!). We haven’t gotten to see the interior yet, but from what we understand the developers ripped the roof right off the original mall and turned it into an outdoor courtyard, with some retail, offices, and residential all facing a lush green corridor. For now, these construction pictures will have to suffice, but it’s likely due for a visit by the Labelscar crew. 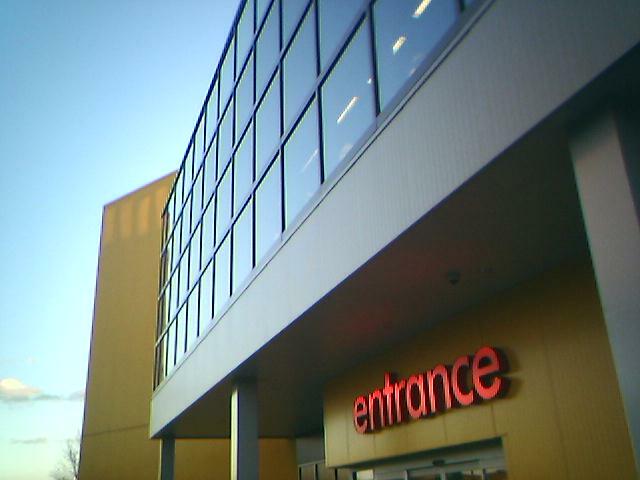 I also swung by to take some fasincating pictures from the nearby IKEA store, which opened to much fanfare in 2004. Built on the site of a former Pirelli Tire office building, it replaces a failed proposal for the Long Wharf Galleria, which would’ve brought yet another large (and more upscale than Chapel Square) mall right downtown. 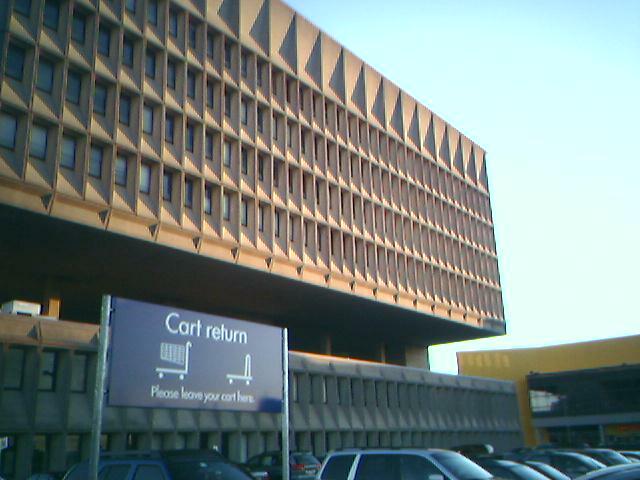 Surprisingly, given that Chapel Square’s been dead for years, New Haven is one of the only cities in the northeast corridor that could be considered “undermalled.” The closest enclosed mall, the gargantuan Connecticut Post Mall in Milford, is over ten miles to the southwest and there are no others serving the city or suburbs. There was a much-ballyhooed controversy surrounding the construction of Long Wharf wherein some potential anchor tenants were strong-armed by mall magnate Westfield (the owner of most major malls in Connecticut) to abandon the project, and they did. Instead, the city got New England’s first IKEA, but because it was too costly to demolish the strange, floating Pirelli Tire structure, it remains today–completely vacant. Like many older cities, New Haven is working towards reinventing itself and it’s nice to see it succeed. I grew up outside of New Haven, and recall visiting the Chapel Square Mall many times. The walk between Macys/Malleys and the rest of the mall seemed cool, but looking back, it was a bad idea. I think one of the reasons New Haven is under malled is the way i95 and i91 come together, it makes for hellish traffic and poor access to locations where a mall could be located. I lived right outside New Haven & I remember that same walk from the parking garage through the mall ,Do you remember the big parakete cage in the childrens shoe department ….Man when I was a kid I used to love that thing….Your right though the reason that mall got voted down everytime was because of the way the highways i ntersected over their on the Q bridge & 95, but then they went ahead & put up this huge store where its just as packed as any mall Ive ever seem Akeea. You are obviously not educated on the Elm City and I am personally offended by your blog. You made several uneducated remarks through your lack of research on the city. Most shocking is the fact that you didn’t mention the Amistad. Which, by the way, paved the way for the development of our legal/justice system. My great grandparents immigrated from Naples, Italy to New Haven, CT. All they had with them was their recipes, the clothes on their back and the Roman Catholic Church. We only trusted our own. For several reasons. My grandparents told me stories about that they were proud of. These stories have a strong foundation of our family. My great grandfather was the first postmaster of New Haven. This was when all mail went through Yale University and was called Yale Station. As I walk my son down the New Haven green and tell him about the troubles that his great great grandparents had to go through to put food on the table, I must remind him that there will always be uneducated pricks like Eric that take up space with a computer and WiFi connection to express their foolish views on a city we should be proud of. @New Haven, Eric isn’t the guy who posted this. Also, the very history of New Haven isn’t relevant to an article about a dead mall. Also, nobody was saying anything bad about New Haven. There isn’t a single negative comment about the city. Only that Yaleys tend to look down on New Haven and the locals in general, but honestly, who cares about what those rich kids think? Chapel Square is still being remodled, but the 2nd level has been converted to courtyard facing apartments. Recently I had to opportunity to view a residence there and they are basically nice living spaces, 1 & 2 bedrooms, 1 & 2 bathrooms, fully applianced open kitchens/living/dining spaces, but the only problem is that they only face into the center courtyard and are accessible only from the street through a long winding hallway. The windows only face inward, so any noise is basically eliminated from the street. Windows on the upper level that face the street surround the hallway to the residences. The entrances on the courtyard side are each different in architectural styles giving them a curbide appeal. The overhead skylight, even though its open from underneath needs to be either replaced or cleaned. The lower level however is being rented out. New stores are moving in and the streets are alive again. A Rite-Aid Pharmacy changed it’s location to the corner of Church and Crown Streets. Cafe Bottega (Italian Gelato/Cafe/Nightclub is on the corner of Chapel and Temple Street. Quiznos, and soon to be opening a nightclub on Temple & Crown Streets. The Macy’s Men’s Store annex under the Temple Garage is now home to 2 Resturants, one mixed Asian high-end and a Diner-Style open after hours in the hub of the nightlife areas and directly across from the recently expanded Criterion Cinemas. The Macy’s building is still being gutted for asbestos and will become the new Gateway College along with the Malley’s lot location. While the Coliseum is still due for implosion and is being dismantled. Part of the reason this hasn’t happened yet is because under the Collesium are all the communication cables for Southern Connecticut in not-so-strong tubes of concrete and fear of the implosion would cause them to burst as well. When the Colliseum does come down however, the area will be redeveloped into mixed use office, recreation, retail and residential spaces, as well as the new location for the Long Wharf Theatre. Ikea still owns the Pirelli building and I’m still not sure what will become of it, but because it’s been registered as an historic place, it won’t be coming down. Even with the Stoughton Mass opening of Ikea, the New Haven location still manages to bring in the crowds and aids to make New Haven the new destination for interesting shops/nightlife and culture in the state. A short note on the Macy’s building here. The store, opened in 1964 was the first store in CT at the time. It was store #20 in the chain. At that time Macy’s was owned privately, and it wasn’t until Federated relieved them from Chapter 11 that it was closed. 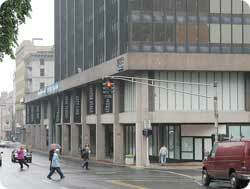 In it’s heyday, the New Haven location was in the top 5 stores (Sales Volume) in the chain. Most of the employees that were there when it closed were there from the day it opened. The building itself is HUGE. There are 3 selling floors above ground, a mix-used basement level (once housing santa-land, then a clearance center), Exectutive offices, Security Offices, Cash Office, Employee Lockers/Bathrooms, Employee Cafeteria, Nurse’s Office, Switchboard, Bag/Box Storage AND recieving area. In addition, there is a Sub-Basement for recieving and a half floor of Visual Merchandise storage reached by staircase and conveyor belt on top. For a total of 6 levels. The store also contaned at one time a Liquor Shop, Pharmacy, Beauty Salon, Restaurant, & Photo Studio. The support colums on the selling floors at Christmas time were painted Red if they weren’t already covered in mirrors, and after Christmas, returned to thier normal white stage. I remember also book, toy, & record departments also growing up. The Malley’s store, though smaller had a more family orientated feeling to it. Malley’s was founded in 1854 and quickly became a New Haven institution. It originally sat on the corner of Chapel and Temple street and was famous for its clock there as a meeting place. East on Chapel street was Shartenberg’s Department Store (Now a parking lot) and Next to Malley’s was the Gamble Desmond Company. I don’t have recollection of the older stores as I wasn’t born yet, but from stories, I seem to know them quite well. The Malley’s store was unique in its departments as well; Toys, Santa, Candy, a Soda Fountain, Fur Salon, Beauty Salon, Bridal Registry but most importantly, on the 2nd floor, by the blue elevators, across from the Photo Studio and down the aisle from the Restaurant, in the Children’s Shoe department was a BIRD CAGE, a big beautiful bird cage, about 8 feet tall and 4 feet wide. I would sit there and watch the birds (parakeets) as my mom would shop! I will always have that memory of my childhood. It was such a treat to go there. The Chapel Square Mall sits in the heart of downtown just across the street from the New Haven Green and steps away from the main campus of Yale University as well as City Hall. The mall area and attached office tower were renovated by a New Haven developer who turned the inward facing retail outward, converted some retail areas into upscale apartments and renovated the rest of the office space. Your blog mentioned that the New Haven area is underserved by malls which personally is a good thing in my opinion. This has helped downtown New Haven to thrive. New Haven has assests that even Providence (New England’s Renaissance City) doesnt have. New Haven is connected to New York City by commuter rail and New Haven is home to an array of colleges and universities including the famed Yale University which has its main campus downtown. Yale has become the city’s largest landlord and has helped bring hundreds of new shops, restaurants, cafes, bars, etc. to New Haven which include both big name stores and locally owned and operated ones. For example the Yale Bookstore is a Barnes & Noble, the only Urban Outfitters in the state is downtown, there is a J Crew, Ann Taylor and Ann Taylor Loft all in street front retail space in the city. Yale has finally helped New Haven to blossom and every day throughout the school year you can see students from Yale as well as students from Southern CT State University, Albertus Magnus College, University of New Haven (West Haven) and Quinnipiac University (Hamden) walking the streets of downtown. All of the renewed life in the city has been done without the help of major redevelopment projects like building a new convention center, stadium or casino. Work is underway in knocking down the New Haven Coliseum and soon work will begin on a new Long Wharf Theater and Gateway Community College will consolidate its to campuses into one big one downtown and bring thousands of more students to the city in a similar fashion to the way that Capital Community College opened up in downtown Hartford, CT. This just shows that superblocks and single use development doesn’t always work in cities. Isn’t it ironic that the malls that were made to replace downtowns are failing because downtowns have become popular once again. There were 18,000 enclosed malls in 1980 (no joke) today it’s 1,104 enclosed malls. Thats got to be telling you something,right? Perhaps Labelscar can examine other failed city malls like the now gone Civic Center Mall and even Lafayette Plaza/Hi-Ho in Bridgeport, both horrible attempts at urban renewal. The only thriving mall/center in Connecticut is Stamford Town Center and that mainly because Taubman knows how to do things right. During the 50s and 60s, New Haven had leadership that worried about the future of their aging industrial city, embraced urban renewal and managed to get funding from just about every federal program that would help. That’s why so much of the center city is full of horrible planning ideas and the reason that the retail near the green managed to limp along for years, despite all this stupidity, and is now the most attractive part of the center. A mall near Long Wharf probably would have failed and, if it did succeed, it would have crippled downtown further. A couple points–Yale contributed to the decline of New Haven, when it supported renewal projects and cleared a fairly stable blue collar neighborhood to build its teaching hospitals. Macy’s was a publicly held company when the New Haven store was built and had been for decades; it wasn’t a private corporation. Macy’s was a not a fancy store in the days that it came to New Haven. They were much more like a May Company chain—famous for bargain basements and middle brow merchandise. When they went more upscale, first in NYC in the late 70s, then elsewhere in the early 80s, the concept often didn’t work. As a result they sold their stores in teh Midwest and limped along for years in Atlanta. The New Haven area had a 50s-style suburban shopping area in Hamden, a suburb that is mostly blue collar, but also home to many Yale faculty. 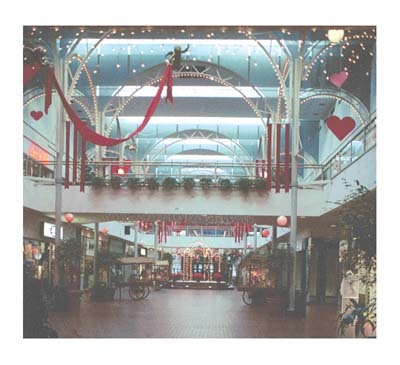 Chapel Square’s real competition came from the mall in North Haven which opened in the 80s. There’ was another mall on the Connecticut Post Road toward Bridgeport that grew in the 80s and took traffic from the southerly/western direction. It isn’t that the New Haven area lacked malls, its just that high cost of building brought malls to most of Connecticut later than many other places. By the late 80s, Chapel Square was identified with gang activity and a lot of people were afraid to go there. What is this mall in North Haven that you speak of? I’ve never been able to find anything about one there, but I do remember seeing something about a JCPenney store that closed there around 2000 or so. I found some listings for a proposed mall in North Haven that would have been built by General Growth in the 2000s, but it seems to have been shot down. By the way, Yahoo! Yellow Pages doesn’t seem to believe that North Haven, CT exists. Strange. There was at one time a proposal for a mall in North Haven, but never came about. North Haven however in the past 10-15yrs has become a major big box center, especially on Universal Drive which at one time was strictly zoned to industrial use. The Coliseum came down, with a BANG! It was awesome to watch! Now the cleanup begins for the re-development. More and more restaurants and smaller shops are opening in the Chapel Square Mall space and downtown is thriving again. It was wonderful to be walking around at 9:00pm and seeing people shopping, eating and browsing this past Christmas. It brought back alot of memories growing up. My apologies to Rich, as he is correct, Macy’s was publicly owned, but in my thoughts it was private. My BooBoo 🙂 anyway, one of the best things that New Haven does have going for it is the fact it has been connected to NYC. It’s odd to me, you can be in Hartford and say “you are going to the city for the weekend” and the people up there think you mean Boston. but in New Haven, it always meant you were going to NYC…It’s odd how CT is split between Boston and New York and New Haven is the dividing line. New Haven train station is the 4th busiest by volume in the country. 100,000+ commuters leave from and return there daily. Rich, If you’re interested, I would love to share with you some great old Macy’s, Malley’s and Shartenberg’s memoribilia I have collected over the years. As well as numerous other now defunct Department Store and Mall items. Let me know if you’re interested in seeing them. It’s really great all the revitalization in New Haven. To bad New Haven ‘s poor and lower midde class weren’t even cinsidered, do you think they can eat at those restaurants or shop in those stores? For the most part I think not. The problems with Connecticut’s cities were that when it came to revitilization efforts in the mid part of the 20th century they had lots of money to spend and spent that money on numerous projects that killed neighborhoods, businesses, homes, etc. For example look at the fact the I-91 and I-95 intersect in the city of New Haven. The saving grace here is that they do not intersect in downtown New Haven. Hartford is not so lucky…I-84 and I-91 cut right through the center of the city. Up in Hartford they took up the entire Front Street neighborhood to make way for I-91 and for Constitution Plaza. New Haven is reinventing itself as a city of the arts (culture, shops, theater, restaurants, coffee shops, etc) as opposed to a city of business. And personally I think its working. There are not many cities today where you can walk around on a Saturday afternoon in January and see tons of people strolling the streets, see restaurants packed, stores packed, etc. But that is not the case in New Haven. Thanks to Yale some national retailers and a lot of independant retailers and restaurants have decided to invest in downtown New Haven. Also a note on the Hartford Civic Center…. 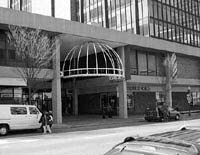 The Hartford Civic Center MALL was once a thriving retail center along with the rest of the thriving retail district in downtown Hartford. (there was at a time G Fox and Company, Sage Allen, Brown Thomsons, Korvettes along Main Street downtown). The civic center mall opened with great success but was also a traditional mall with inward facing retail space that didnt help foot traffic outside. The mall slowly deteroiated over the years and finally a major redevelopment project was proposed for the site and the days of the Hartford Civic Center Mall were numbered. The mall was demolished and in its place a 36 story luxury apartment tower with 262 luxury apartments was built. Alongside it is a large retail and office space block that will have retail that faces outwards onto the streets. On the back side the Hartford Civic Center arena is still there. This project has attracted the YMCA downtown and has attracted downtowns first supermarket in years which will open next year…a major step of progress in downtown Hartford. I have some bags from the 2 Taubman Centers, both the same bags, with different locations on them. (Stamford Town Center & Westfarms) One of the things I wished I saved, and havent been able to locate were all the mall directories, I know I have them, I’m just not sure where in my parents attic they are located. I also have the original “Pavillions at Buckland Hills” bag the day it opened. I hope to be updating my blogspot with those but check out some of the stuff I’ve put on there in the past 3 days since I started it. A note on the post by Michael. One of the reasons the 91-84 interchange is so messed up, is thanks to Beatrice Auerbach of G.Fox fame. When the state was planning the highways, she was a major influence in the design because she wanted both roads to bypass her store. That’s some fascinating insight there about 84/91 interchange, bagman. And I would love to see your old memorabilia! I cross that intersection every weekend and I hate how awfully tight everything is. So because of G. Fox, the 84 West exit had to be coupled with a Hartford exit! I remember seeing the G. Fox label scar as a kid. I still look for it, but I know it’s been washed over with Capital CC took it over. I was fully aware that Mrs Auerbach wanted the interstates to intersect in the heart of Hartford by her store. The city and the state sadly decided to listen though and sadly plowed through the heart of the city. They left on one side a thriving central business district and on the other side not much of anything. Now that Hartford is working to revamp itself with smart growth measures hopefully they will not make these mistakes twice..
Also I am pretty sure I have a christmas bag from G Fox in my basement as well as one of the long bags that you put coats in from G Fox. I may also have some Sage Allen bags. Back when my mom was a teenager she worked at G Fox in downtown Hartford and there was a time when my grandfather delivered for them…they delivered every day all day. Right you are Michael. You don’t want to end up in the North end of Hartford. I hear it’s just a very unsavory place. My girlfriend’s mother, who works for the DHL company used to drive a truck through there daily and had plenty of horror stories she’d tell me. I’ve heard other stories from a local mechanic who works for Monroe; used to be a cop and told a relative story. It’s sad that there are areas of Hartford you shouldn’t go especially since there’s a lot of good, improvished people in that end alongside the drug activity, addicts and gang violence. Ok first of all Im just going to put this out there…I love Hartford: the good and the bad. All of the North End of Hartfod is not bad, there are thousands of hard working families and businesses. Hartford like so many cities was allowed to deterioate because people left cities for suburbs and left the poor and usually minorities in the cities. Changes are being made though today and there are a lot of changes being made to better Hartford in places outside of downtown where there is a new convention center, hotels, apartments, condos, restaurants and a new science center). For example the University of Hartford will be constructing a Performing Arts Center on the site of the former Thomas Cadillac site in the North End. Near that are some of the “projects” that are still left in the city. Over the next few years like the other projects in the city they will be torn down and replaced with multi family and single family homes to increase home ownership in the city. Along Capen Street and Garden Street Habit for Hummanity is building dozens of homes to increase home ownership. Over in the southern end of the city near the Colt Gateway project the Dutch Point Housing Project was torn down and replaced with muti family row houses. There are areas of the city that a suburbanite would never visit in a million years but some of these areas are thriving retail and residential areas that cater to certain groups of people. For example Park Street is filled with shoops, restaurants, offices, businesses, supermarkets, etc. that all cater to the Hispanic community. There are barely any vacant store fronts here, all the parking spaces on the street are taken, there are people walking all over the placec and people come from the NY, Boston and western MA area to shop and eat on Park Street. Cities are always changing …it is never to late. Right now I go to college in New York City and up in areas of Harlem major changes will occur over the next 30 years. In areas that were once home to Italians, Irish, etc. and then later home to Hispanics and African Americans change will once again occur. The 2 subway line will be extended northward giving people direct access to the eastern side of Manhattan (upper east side, midtown, etc). This means students, young professionals, yuppies, empty nesters, etc will most likely move northward into areas once thought of “dangerous” or “sketchy”….sound familiar. All cities have experienced in the past 40 years or so, a decline and most are also experiencing a rebirth now. People in suburbs are moving back to the cities, I know I did. I live not too far from the area I grew up in, in New Haven before we moved to the suburbs. I’ve always felt a good sense of safety in an area that was ethnicly-mixed. Yes, the suburbs are great if you own a car, but I refuse to do that. I enjoy public transportation, and walk to work. With the money I’ve saved not owning a car, I’ve been able to travel more. Eat out more often and enjoy the other things besides the nitelife that the cities offer. Just goes to show you, what goes around comes around. OMG! Talk about a blast from the past, I just found my Generra Hypercolor t-shirt that I purchased at the Chess King in the Chapel Square Mall in 1986!!! and it still works 😀 !!! Bagman64 I truly praise you for your mve back to an urban core and for your use of public transportation. I truly hope many more people follow in your footsteps. Michael, check out the G.Fox post i recently put on my blog site. I’ll be posting a Sage-Allen one as well soon. Maybe some of the Items you have will match some of the ones I have! bagman,i have been searching all of my life for some photos of inside the old malleys. actually,macys was a mystical place for me as well growing up..but i was just six years old when malleys closed. to this day i have dreams of the place! !if you can,PLEASE email me at orenn52@hotmail.com with your contact information. thank you sooo much. this is fascinating fodder for us fashion bloggers (not to mention us new haven newcomers)–thanks for the info! My memories of Chapel Square are somewhat hazy but for some reason I clearly recall the entrance from the parking garage into Malley’s through a rather inconspicuous door. I was in town last year and we took a spin around the place – the funky cast concrete parking garage was still there. There was also a proposal for a mall in Hamden during the mid-’80s, using the then-standing Sears as an anchor (at Skiff and Dixwell Avenues). I may still have clippings somewhere in my collection. I noticed you also have a page on the malls of Syracuse. Having grown up in New Haven and gone to college in Syracuse, the difference in number of malls is striking considering their other similarities (population, large university). The Pirelli building was not retained due to the high cost of demolition. Rather preservationist groups threw a hissy fit because of its unique architecture and demanded that it not be demolished. This was an interesting blast from the past… I don’t live in New Haven anymore–I live in Cleveland now–but I miss it, believe it or not. A lot of people rag on New Haven, particularly those who never gave it a chance. You have all those people who live out in Branford, Milford, Orange–you know, the ‘burbs–who would never go downtown to do anything only because the news said there was a murder, drive-by or what have you. What Channel 8, 3 or 30 never told you was it was over on Davenport or Columbus Avenue, far away from retail or the bar scene. What people in Branford (where I used to live) and all the communities like it missed was that New Haven has to this fantastic night-life. Great bar scene that you won’t find in Hartford or Bridgeport, and a restaurant selection that is second to none in a city twice New Haven’s size. Cleveland’s top 5 restaurants would not make the top 20 in New Haven. (Please, spare the Cleveland jokes, they’re old and Cleveland has its own great attributes). My one glaring criticism of New Haven is not really New Haven’s fault–the age old conflict of have a premier university located smack dab in the middle of the city. In of itself, it is a wonderful thing because many of the things that make New Haven a great place is because Yale is there. But I question the wisdom of converting the 9th Square area and surrounding blocks to this Gateway Project. The Gateway Project will dedicate more land (New Haven has a finite amount of it) to non-profit organizations that will reduce further the tax revenue the city can collect from an already dwindling property tax base (thank you Yale for buying up all those houses for sale). I don’t have any answers to this conflict, but I suppose it is better to have something in the area besides vacant lots where the students, presumably, can spend their money and help the city’s revenue that way. I loved the old Malleys store on the corner of Church and Temple. Those were the days; a real department store with quality merchandise. Anyone have any photos of the New Haven storefronts of the 1950’s? New Haven changed for thw worse when the NH Arena and the NH Blades hockey team were allowed to be demolishedm, and leave, respectively. New Haven was aland wlays bwill be an “Arena” type of town, and the city’s miserably failed attempt to buo,d and Coliseum abd remake itself into something it could never be, lingers to this day. Thankfully, Yale put some of their $$ behind a few erstwhile projects, and slowly but surely, many of the porrer neighborhoods and the idiotys who live there and peddle their drugs and shot their guys, are gettig the heave ho. but its taking a looooong time. Does anyone know the name of the record store located in this mall? I did an article about record stores in Connecticut and visited New Haven to go to Cutler’s (which has a bit of everything) and Red Coat Records, in West Haven, which was mostly hip hop and R&B. I spoke with the owner there, but, never realizing New Haven had a mall, didn’t ask him if Red Coat was once located in New Haven. Considering West Haven is pretty empty, it would make sense if this store was once part of Chapel Square Mall. To Mark’s comments I say sure, many of the efforts New Haven tried to improve commercial and subsequent tax revenue were failures. However, New Haven’s problems are far more complex than to blame them on poor government initiatives. You tout Yale’s contribution to some “erstwhile projects” and think that is the answer? Yale is simultaneously the reason for New Haven’s existance today, and also the reason why New Haven as a municipality will never succeed. New Haven has one of the highest mil rates in the country because of the “generosity” of Yale. Yale “Corporation” should be investing hundreds of millions into the city that bears the burden of its “non-profit” status. And still, every time a property goes up for sale, Yale snatches it up and removes it from the tax revenue of the city–and then people give them credit for a marginal at best reinvestment in the city. How many BILLIONS of dollars is Yale’s endowment worth? What’s it now? $50,000,000,000? That’s a lot of zeros when the city is suffocating on their non-profit status… So before you throw this white knight status on Yale, consider that the bright Ivy League administration did not have the foresight to recognize that suffocating the city’s revenue in which they reside would ultimately affect them. This partnership should have happened in the 70’s. Now it may be too late. It’s too bad. I love New Haven AND Yale. But I recognize the failings of both. But you’re right on one thing–they have to work together for it to succeed on any level. The record store that was in the mall in the early 80’s was called Record World. I loved the mall since it centered in the heart of downtown. All buses in New Haven stop downtown so everyone at one time or another had to go downtown by bus. The mall was fun in the 80’s when I was in middle/high school. I remember the one day sales at Macy’s and the doll house at Malley’s that lit up. I remeber when designer handbags were all the rage in the 80’s and Macy’s downtown New haven sold Fendi, Gucci and all the latest clothes at that time. I have fond memories of the mall but appreciate the “new” New Haven. I haven’t left the area because of the close approximty to NYC and Boston. You have the benefit of a small city and the ability to go to a major in two hours and go back hom the same day. Great blog site!! I stumbled on this by accident but have always been fascinated by malls and for every city I have visited I always search out the malls in the area. I remember the good old days when there was the Connecticut Company Bus Company as I took the bus to go shopping downtown New Haven. People really dressed up back then. I must say that the Chapel Square Mall was something in it’s heyday. Wonderful shops and restaurants and the Trianon Lounge in the Park Plaza Hotel. I also worked at Macy’s and remember the Edward Malley Company. I remember when the National Guard guarded downtown New Haven, which was closed due to a rally on the New Haven Green. I remember Cutler’s Record Shop. There were a lot of fond memories and I will never forget the good old days. I moved to South Carolina in 1975 and came back years later to see that nothing exists anymore. If we could only turn back the hands of time. Shopping during the holiday season was especially wonderful. It’s really sad to me that you can’t bring any of it back. No matter how much they try in updating this mall, they nor any architect will never reach the simple, clean, modern and artistic excellence of the malls of the past. I grew up in New Haven during ‘ its day ‘. Malleys, Macys, W. T. Grants, Kresgees, American Discount, you never had to leave the city. I remember at Christmas mom would take us window shopping during the NIGHT, yes the night. Everything was beautifully decorated and their were no strangers, everyone was friendly. I remember in W.T. Grants for a fee they would give the kids a fishing pole with a hook on the end. We would stand on the upper level and drop the line ‘downstairs’ and try go hook a persent. That was really fun and memorable, obviously. I remember as a young adult working at SNET and going to the Galleria in Chaple Square for dinner; I worked 4-12. I remember sitting on the green eating salad from Vitto’s on Center St. Ah, least I forget Karmel Corn on Center St – before Vittos. Those were the days. I still love going into New Haven. New Haven has a certain mystique even though it’s lost most of its stores. It is, and always will be, home. @Marvin, Ah…Karmel Corn…I remember that also. Could not go home on the bus with my grandmother without a box or two of that !!! I remember that wonderful smell and it also brings back memories of walking on the green and feeding the pigeons. Many summer afternoons were spent walking around the mall area. My favorite store to buy clothes at was Lerners. I know there has to be change along with progress but its just not the same. I have a great love for the city I grew up in …New Haven. Ct. I came from Legion Ave, a wonderful melting pot of many nationalities. As a kid in New Haven I was particularly fond of the downtown area it always seemed so cool, I would stand outside a Mactriffs bar on Chapel & Park St. listening to the jazz musicians playing there. I so intrigued and swallowed up by all that sounds I heard. I promised myself that one day I to would be a musician . I traveled many paths and wore many hats but the promise rang true, I passed by that area where Mactriff’s was many times since then, finding myself continually reminiscing . about a year ago I finally wrote the song Mactriff’s to fit the mood and do justice and validate my childhood promise. I am in the process of recording Mactriffs and other songs i’ve written this project a music DVD. I am looking for any pics of Mactriffs Chapel street location …. That would be so cool. why is new Haven devoid of malls? @daniel Fife, New Haven is one of those cities that doesn’t need a mall. However there’s Westfield CT Post in nearby Milford. There’s a great burger place called Louis Lunch at 263 Crown Street in the heart of the Yale University campus. Check it out. @SEAN, I agree. New Haven does not need a mall. Plenty of shopping all over town, especially Broadway. Plus, New Haven is a lot nicer than it was 15 years ago, so that’s another plus in their corner. is a lot nicer than it was 15 years ago, so that’s another plus in their corner. As an 80s child(born in 83)and a kid that really grew up in the 90s I can truly say that I remember Macy’s and the Chapel Square Mall. 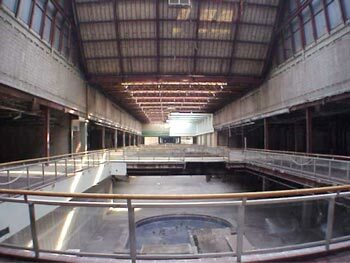 I remember the empty Malley’s building but didn’t experience the store as they closed down the year before I was born. New Haven is just not the same without those places, and the Colisium, which I also remember very well and did experience. From the new haven circus, car shows, Disney on Ice, hockey, playing hockey, and the Phish Concert in Nov of 1998. Remember when I was real young my mother would take me Christmas shopping at Macy’s, and the mall. A somewhat scary memory I have from the mall at the food court was with my mom and brother. This was probably in 1989 or 1990. There were some thug looking gangsta’s at a table next to us and I vaguely remember some arguing and then my mom grabbing my brother and I and just taking us out of there really quick followed by several new haven cops strolling in pretty quick with a purpose. While new haven was really bad at the time and the mall without question did have some sketchy events, and did attract crime, the memories are still really good. New Haven just doesn’t have the same spirit without any of those places. This is a great blog, thank you.